While the newly launched OnePlus 5T smartphone is getting a lot of attention these days, it looks like OnePlus has not forgotten its older models. Last month, the company released the OxygenOS 5.0 for OnePlus 3/ 3T smartphones. And now, just in time for the new year, the manufacturer has announced the availability of OxygenOS 5.0.1 for last year’s flagships. The new OxygenOS 5.0.1 update adds support for Qualcomm’s aptX HD Bluetooth audio codec, December security patches, and a handful of bug fixes. But sadly, it also introduces a bug. According to multiple reports over at OnePlus’s forum as well as on Reddit, users are seeing a ‘Uninstall harmful app?’ warning after updating to the latest build of OxygenOS. 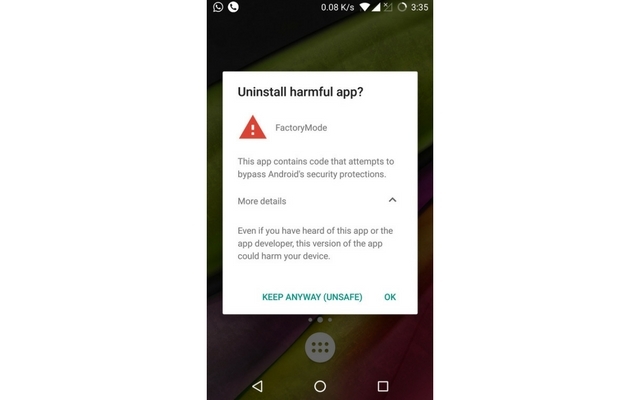 As seen in the screenshot attached above, this Google Play Protect warning message recommends users to uninstall a system app called ‘FactoryMode.’ In case you are wondering what this is, the ‘FactoryMode’ used to be known as ‘EngineerMode,’ and it is used by the OEM during the testing process. The app, however, received a massive outrage from security researchers who highlighted the possibility of attackers easily messing around with your phone if they got access to it. This forced OnePlus to rebrand it as FactoryMode, and it’s only used for diagnostic purposes, the company says. So there’s no danger to your device if you choose to remove it as well. As of now, OnePlus is yet to comment on this, but we’ll be sure to update this article when there’s more clarity on this matter. In the meantime, you can let us know about your experience with the OxygenOS 5.0.1 if you’re already on this update.